Calling all our members – do you want to join our NGS scheme advisory group? Back to: Latest News Next: Want to work for EMQN? 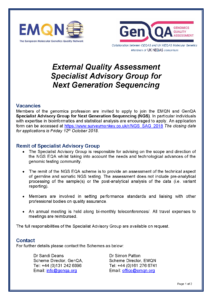 Members of the genomics profession are invited to apply to join the EMQN and GenQA Specialist Advisory Group for Next Generation Sequencing (NGS). In particular individuals with expertise in bioinformatics and statistical analysis are encouraged to apply. An application form can be accessed by clicking the image below. The Specialist Advisory Group is responsible for advising on the scope and direction of the NGS EQA whilst taking into account the needs and technological advances of the genomic testing community. The remit of the NGS EQA scheme is to provide an assessment of the technical aspect of germline and somatic NGS testing. The assessment does not include pre-analytical processing of the sample(s) or the post-analytical analysis of the data (i.e. variant reporting). Members are involved in setting performance standards and liaising with other professional bodies on quality assurance. An annual meeting is held along bi-monthly teleconferences/. All travel expenses to meetings are reimbursed. The full responsibilities of the Specialist Advisory Group are available on request. A quick reminder that our office email address is office@emqn.org. With best wishes from the EMQN and GenQA Teams. Next: Want to work for EMQN?